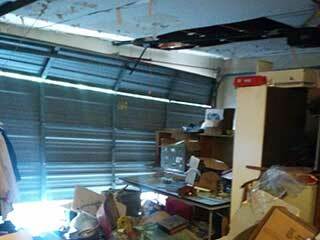 There are many different issues that your garage door can be affected by. These types of systems are under a great deal of stress on a daily basis, and when even the smallest component breaks the entire door can be rendered inoperable. Trying to fix things by yourself is a recipe for disaster, so you better contact our team when you need any type of professional assistance. Your garage door relies on a system of cables and springs in order to move up and down smoothly and evenly. If the condition of these components is compromised, it can affect the performance of your system. If a spring or a cable breaks, the door wouldn't be able to open. Not only that, it would actually be dangerous to even try and move it manually. Our technicians can replace the damaged component with a more durable one, and we'll adjust everything afterwards to make sure the tension is distributed evenly. The tracks are the components that guide the rollers, who in turn facilitate the movement of the door. If any of these becomes damaged or misshapen, the door could get stuck, or worse, it could collapse. A door that got off track is very dangerous, as it can weigh upwards of three hundred pounds. Needless to say, dealing with this type of scenario is a risky move, and should be left to the professionals. The rollers themselves could be the cause of many issues as well, but our technicians can replace as many of them as necessary to make sure your door continues to move smoothly. Sometimes, the door itself could become damaged. This can be due to a car accident, or just some neglect which allowed rust or rot to develop. Whatever the reason, the problem needs to be address. Our team can replace any affect panel with a new one of a matching design that will preserve your door's curb appeal and allow it to continue keeping your home safe and secure. Our team at Garage Door Repair Harrisburg can repair every single part of your system, regardless of how complex the problem may seem. Contact us today for more information. There are a number of reasons why your door won't move all the way up or down. The main reason is that the opener limit switch that determines how far up your door can travel isn’t set correctly. This needs a simple adjustment to resolve. Another reason could be that your door is not properly aligned. The tracks’ fasteners could have loosened and as a result the door struggles to get past a certain point. If that is the case, you may want to call for some help, to ensure the door returns to its balanced and aligned position. Why is my garage door reversing? If your door keeps reversing when you try to close it, the photo eye sensors could be dirty or misaligned. The sensors can't tell the difference between an obstruction or dirt if it’s covering their lenses, and the door will not function properly. Simply take a soft cloth and wipe the dirt off the photo eyes. Once cleaned, try to close your door again. If it still won’t work, then sensor realignment or repair may be required. Why isn't my garage door opening? There are quite a few reasons why your garage door won't open. It could be a problem with the opener remote or the opener itself. The remote may simply need fresh batteries so try that first. Then you should try opening the door via the wall panel switch. If you are still having problems it could be a broken spring problem or some motor issues. Opener troubleshooting is probably required to locate the source of the problem and solve it. This sounds like a job for – us.